I recently completed a wood carving project to create a Celtic inspired semi-heraldic Marriage Shield as a gift for my spouse. The design incorporates symbols that represented the joining of our two houses, and since we both come from predominantly Irish ancestry, I wanted to create a shield with symbols that were designed in an early medieval Irish manuscript style. It was my intention to complete this project in time to mark our fifth anniversary, one that is traditionally celebrated with gifts of wood, which occurred in January of this year. This obviously was not the case, but I am happy to have it done before our sixth anniversary arrives! I finished the actual carving of the shield last summer, but I spent a long time working out the details of how I wanted to paint the finish. I have been working to find the right combination of paint and medium that will let me apply color in a similar manner as the watercolor paintings I do on paper. I was finally able to get the results I wanted on another project I completed in the beginning of the summer, so I began the process of painting the shied this fall as soon I was able to find a block of time to devote to finishing the project. I am very pleased with the final results, and hope my spouse agrees it was worth the wait! This project is one of the more personal things I have created of late, and the process and reflection that went into selecting the design elements and designing the symbols in a way to capture the complex feelings that a marriage represents has been some of the most satisfying creative work I have done. Symbols, when thoughtfully chosen, can speak more clearly at times when words are not enough. If you are interested in having me create a wood carving to represent your marriage, I am available to take commissions to create custom order marriage shields – please use the contact form in the top menu under the “About” heading to find out more. Rough carving of the Marriage Shield. Beginning to refine the carving of the crow element. 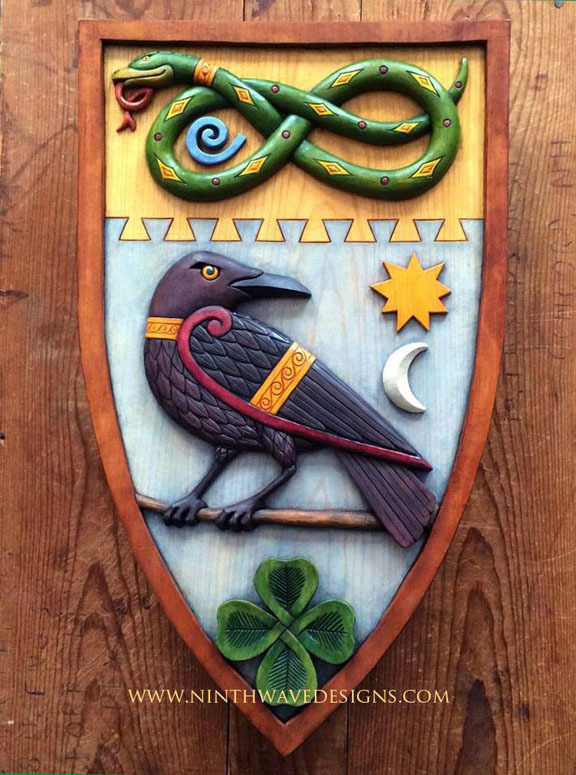 Detail of the completed crow element from the shield. Detail of the serpent element. The painting process, about half way through. A close-up of the wing of the crow, before shading is applied. 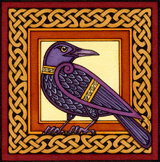 The finised painting of the crow element of the shield.